When you have a running WordPress Website or blog about your passion but there is no such an effective way by which people can easily contact you. You may think now, you can put your email in anywhere of your website for this reason. But, here the questions come like – is it safe? Do I really need a contact form for my website? So, before showing you the way to add a Contact form to your WordPress website, let’s find out those answers. The Reasons: Why You Really Need a Contact Form for Your WordPress Website? Example of the Contact Form that We’re going to create on WordPress. So, How to Add a Contact Form to WordPress Website? Protection from Spam/Bots– When you post your email address on the website, you will start to receive a lot of spam emails. Because Spambots regularly scrape websites for the mailto: email address tag. But when you use a contact form, you can get rid of almost all spam emails and this way your site will be more secure. Consistent Information – People will not always send you all the information that you need when they emailing you. But, with a contact form, you can tell the user exactly what information you’re looking for (such as their phone number, budget, etc). Saving Time – Contact forms also help you save time in more ways than you can imagine. You can use form confirmations to tell the user what are the next steps, such as watching a video or wait up to a fixed time to get a response. As a result, they don’t send you multiple inquiries. I hope you’re clear now about the importance of having a contact form on your WordPress site instead of putting your email as naked! You should even also add a subscribe box to your WordPress site for better engagement with your visitors. Adding a contact form on WordPress is not so hard, however many people think it needs high coding knowledge. But, this conspiracy isn’t true. There are the ways exist, so you can add a Contact form through a few quick steps. Here, we’ve used a free plugin – ‘Contact Form 7‘ to create and add a contact form to WordPress. However, there are other options available like Gravity Forms. So, let’s have a look at the steps to create a Contact form for your WordPress website. In the process, at first, create a page named “Contact” or “Contact Us” (as you wish). It’s so simple as like as doing a New Post. But, if you don’t understand go to the ‘Pages’ section on your Dashboard (left side), hover it, and click ‘Add New‘. It’ll open a new window where you can create the page. But, if you’ve already created the Contact page, then go skip this step and go forward. Now, you need to install Contact Form 7 plugin. Simply go to ‘Add New‘ under the plugin section of your WP Dashboard, then search for it on the ‘Search bar‘. You’ll find it, then click the ‘Install‘ button and it will be installed. Now, go to ‘Installed Plugins‘ section, where you’ll find Contact Form 7, simply click the ‘Activate‘ button. And, once you’ve activated Contact Form 7 plugin, you’ll find a new Contact button on your WordPress dashboard (check left sidebar). Hover over the button and click the ‘Contact Forms‘ button and you’ll find a screen like above. Now, simply copy the ‘Shortcode‘ and open the page that you’ve created as ‘Contact’ or ‘Contact Us‘, then paste the ‘Shortcode’ into it. Now, publish the page. That’s it. Now, you have a Contact Form on your WordPress website (same as the Example above). 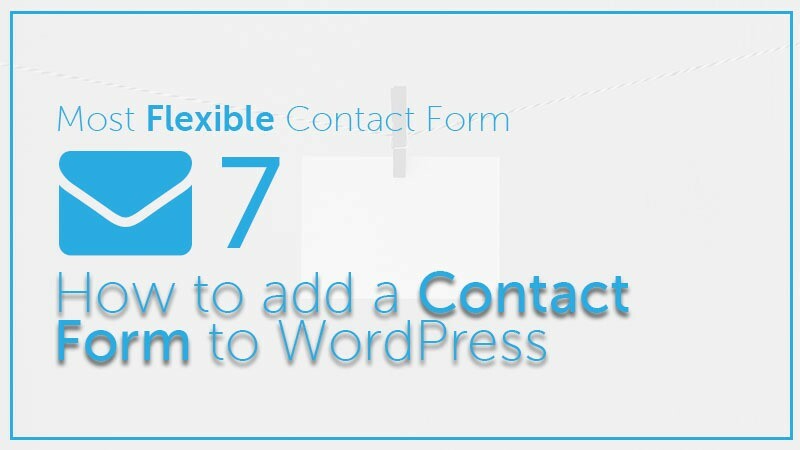 So, this is one of the easiest ways to add a Contact Form to WordPress website using Contact Form 7 plugin. If you have used any other plugin or way to add a Contact Form on your website, or if you got anything to share with us about this post, feel free to let us know with commenting. We’ll be glad to know that.